All are welcome to attend! Meeting registration is just $10 with no pre-registration required. Registration will begin at 5:00 PM on Friday, May 17. Driving Directions: Exit I-40 at exit 125 and proceed south on US-65B S toward Conway for approx 0.3 miles. Destination is on your right. Look for the ANPS sign. A total of 25 rooms are reserved, and if we meet this number, it will ensure that we have the large meeting room at no charge. 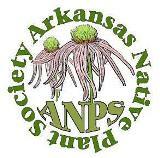 Please make reservations soon and be sure to mention that your are with the ANPS meeting for the reduced cost. There are other accommodations in the area if desired. The hotel has two floors (no elevators) with interior rooms in the atrium. The 25 rooms reserved are 18 interior and 7 exterior. The 18 interior rooms have two double-beds and are non-smoking. The exterior rooms adjoin the parking lot and have both smoking and non-smoking. The 7 exterior rooms reserved are 3 double queens and 4 kings. If more king or queen beds are needed, and if available, they can be reserved at the group rate. All rooms reserved are non-smoking. The reduced group rate is $67.50 plus tax and includes breakfast. Checkout time is 11AM. Dining Options: We will have a potluck meal on Friday and Saturday evenings. Bring a dish or just come and join us and eat. There is no kitchen refrigerator, so leftovers will need to go back to the refrigerators in our rooms or if it’s a large dish, in your ice chest. A microwave is in the nearby breakfast bar. The Los Tres Potrillo’s Mexican restaurant is on site and has a connecting bar. There are also other dining options near the hotel. Field Trips: A number of field trips to nearby areas of botanical interest will be scheduled for Saturday, 8-9 AM to 5 PM, and Sunday, 8 AM to about 12 PM. Start times are at the discretion of the field trip leader. Bring water, snacks, insect repellent, hats, sunscreen, walking sticks, and boots for wetter areas. See detailed field trips list to follow later. You must sign up for the field trips on Friday evening to allow for planning by field trip leaders. Field trips will include the Jewel Moore Nature Reserve (Conway Prairie) at UCA, Bell Slough Wetlands with bottomland hardwoods, tupelo and cypress at lake and sloughs. Camp Robinson Special Use Area has varying unique habitats, and more detailed information on this field trip to follow. Other field trips may be added. 5th Annual Silent Auction Fundraiser – 6-8:30 PM — bring your contributions of plants, books, homemade jelly, seeds, anything native-plant related. New this year is an ENTIRE table of books donated by Norm and Cheryl Lavers, Jennifer Ogle, Johnnie Gentry, Edith Huey and others. Have your items in place and ready to go by 5:30 PM. A bid sheet for you to download and copy is at the bottom of this letter so that you can have it filled out in advance. The Silent Auction will end after the last speaker, around 8:15 PM, and items will be paid for and whisked away by the lucky bidder on Friday night! The Conway Prairie, past, present, and future. For complete and up to date details, go to http://www.anps.org or contact Susan Hardin at whizcats@sbcglobal.net, cell 501-584-8455 or Becky Hardin at rebeccabutch@aristotle.net, cell 501-584-8545. Lodging at Hampton Inn – Arkadelphia, with meeting site at Parks & Rec Bldg. at Feaster Park in Arkadelphia.